Explore Bangkok's surroundings by going to Ancient City (in Samut Prakan) and Ayutthaya (Wat Chaiwatthanaram & Wat Mahathat). Spend the 21st (Fri) wandering through the wild on a nature and wildlife tour. Spend the 27th (Thu) exploring nature at Dong Phayayen-Khao Yai Forest Complex. 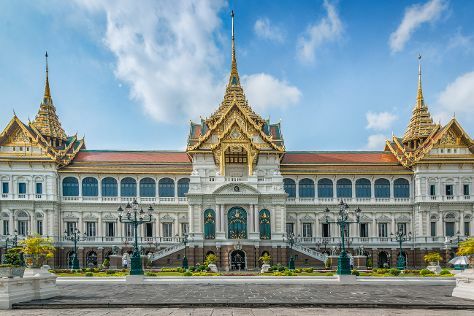 The adventure continues: step into the grandiose world of The Grand Palace, admire the striking features of Jim Thompson House, take in the spiritual surroundings of Temple of the Golden Buddha (Wat Trai Mit), and hunt for treasures at Chatuchak Weekend Market. To find other places to visit, reviews, and tourist information, use the Bangkok trip planner. If you are flying in from Singapore, the closest major airports are Suvarnabhumi Airport and Don Mueang International Airport. Expect a daytime high around 39°C in July, and nighttime lows around 30°C. Wrap up your sightseeing on the 28th (Fri) to allow time to travel back home.